This SUNDAY in R.E. the Chalice Children talk about how our differences are interesting and special. The Roots and Shoots Friends continue their learning unit about lemurs and welcome their new mascot (“Jeff the Lemur”) to the class. During the Worship Service, Youth will meet in the library to engage a session about Responsible Leadership. Following worship, the Our Whole Lives is back after a well-deserved week off. The class will have a session on the subject of abstinence. 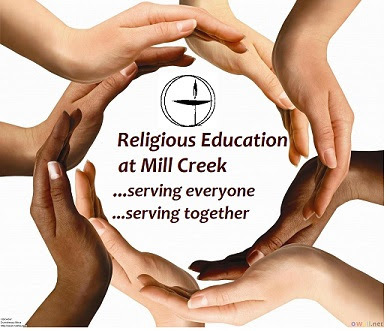 Mill Creek has a vibrant and active Religious Exploration program for Adults. We believe learning and faith development do not end with childhood, but are part of a lifelong process. Adult R.E. at Mill Creek is a welcoming place to encourage one another throughout our own journey of spiritual growth. Whether you have been a Unitarian Universalist for many years or are new to the faith, chances are you’re curious about many issues and subjects that impact your life and the lives of others. Our team is committed to designing, evaluating, and overseeing adult faith development programs at Mill Creek. Do you have an idea or a request for an adult workshop, class, or discussion group at Mill Creek? Contact Terry at dre@uusmc.org. We are committed to serving your needs! Sunday morning Adult RE sessions are held every week in the MacArtor Library from 9:15-10:15 am. NO registration is required for Sunday mornings. Just drop in! Our new series, Spirit in Practice, begins this Sunday, January 27. We’ll be talking about ways of moving towards a richer and more meaningful Unitarian Universalist spirituality. In the coming weeks, the group will explore diverse spiritual practices and disciplines. Shared Pulpit Workshop – registration for this class is now closed. If you were unable to participate in this class, it will be offered again in the fall. Email our Director of Religious Exploration, Terry Vodery, at dre@uusmc.org if interested. This is a four-week workshop exploring the experience of growing up white. It will be a deep and challenging workshop, but will be framed by reflections on a common read of Debby Irving’s book, Waking Up White. Several copies will be available in the library. Mary Higgins leads the group on Sundays following worship 12:00-2:00 pm: February 10th – March 3rd, in Classroom #1.